This is an essential read for every practicing music therapist and music therapy student. Too often we get caught up in how to help others and neglect helping ourselves. This book helps the reader to identify areas of potential burnout. It also provides clear cut and easy to follow instructions on how to create a personalized self-care plan. What I love about this eBook is that it is not just a self-care book for anyone- it speaks directly to music therapists. It has easy accessibility, is written in both an elegant and practical language, and is a resource that can be revisited to re-establish a baseline to continue to improve in self-care. 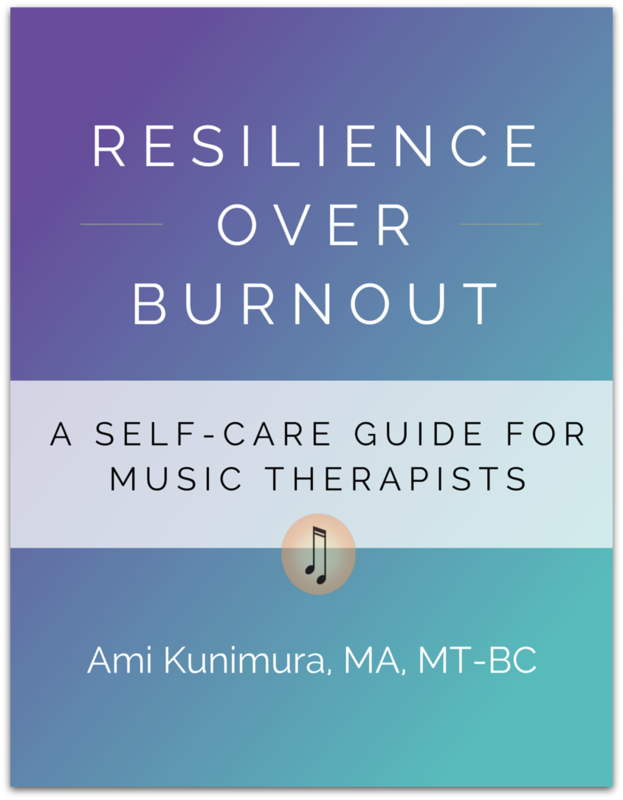 Resilience Over Burnout is an 80-page eBook designed to help music therapists redefine how they approach self-care and reach new levels clinical effectiveness, career success, and personal fulfillment. Ami Kunimura’s Resilience Over Burnout eBook is a must have tool for increasing self-care practice as a music therapist. Unlike other self-care workbooks, this book is just for music therapists! It provides music therapy specific situations that cause burnout, helpful self-care exercises to practice (both musical and non-musical), and a clear and easy way to develop your own self-care plan. One of the best things about this book is that you can visit it at any time if you feel like you might need to reflect on how you are caring for yourself or how you may be neglecting personal needs that could potentially affect your professional work. I would recommend this book to music therapy students, interns, and professionals! I loved learning about specific types issues that lead to burnout – it helped me feel like I wasn’t alone in my struggle to manage self-care. While I was reading and interacting with this book, I found myself thinking of specific colleagues who could benefit from such an educational, concrete, and hands-on resource! 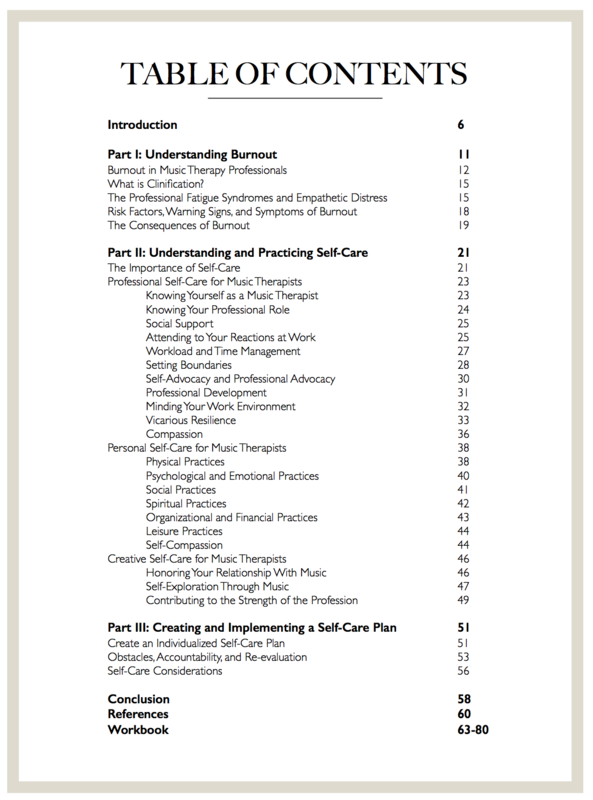 Access to the Resilience Over Burnout Self-Care Support Network, an online space to connect with others reading this eBook. The opportunity to treat yourself with the same kindness, concern, and attention that you give to your clients- by identifying your own strengths, challenges, and goals. It’s time now to give back to yourself. Self-care is often talked about, but is much more difficult to put into practice. Ami’s book not only breaks down the reasons why the idea of caring for ourselves is important, she offers a number of ideas and life changes to consider in order to more fully put these ideas into daily practice. Suggestions are provided in a non-judgmental manner and the reader is encouraged to self-reflect at their own pace. This book would be helpful to therapists at any stage of their career and serves as a gentle reminder to allow ourselves permission to take care of us as well as of those we care for. Resilience Over Burnout: A Self-Care Guide for Music Therapists is approved by the Certification Board for Music Therapists (CBMT) for 3 CMTE units. For more information on how to earn CMTE units click here. After completing your payment, a download link will be emailed to you immediately. The eBook is in a PDF format. I’m a music therapy student. Will this book help me? YES. The time to learn about self-care as a music therapist is now. This eBook is highly recommended for music therapy students and interns. What do I do if I have trouble downloading? Email info@harmonyresource.com to get any technical issues resolved. A full refund will be given within 90 days of purchase to any music therapy professional, intern, or student who purchased the eBook, completed and submitted the workbook exercises, and was not satisfied with the eBook. I already bought the eBook and now I want to earn the 3 CMTE units. Do I need to buy the eBook again? No, if you have already purchased the eBook, you just can pay the additional $51 fee to earn 3 CMTE credits. Email info@harmonyresource.com for more information. For more info on how to earn CMTE units, go to this page. I don’t know if I want to buy the CMTE option or not. Can I purchase only the eBook and then pay later to get the CMTE credits? If you are not sure if you want the CMTE units, then purchase only the eBook. Yes, you can pay the additional $51 fee later to earn 3 CMTE credits. Email info@harmonyresource.com for more information. Then, follow the instructions on this page to earn your certificate of completion. How do I earn CMTE credits by reading this eBook? 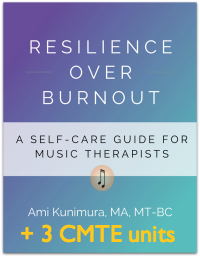 Resilience Over Burnout: A Self-Care Guide for Music Therapists is approved by the Certification Board for Music Therapists (CBMT) for 3 CMTE credits. Click here for more information. Email info@harmonyresource with any additional questions. 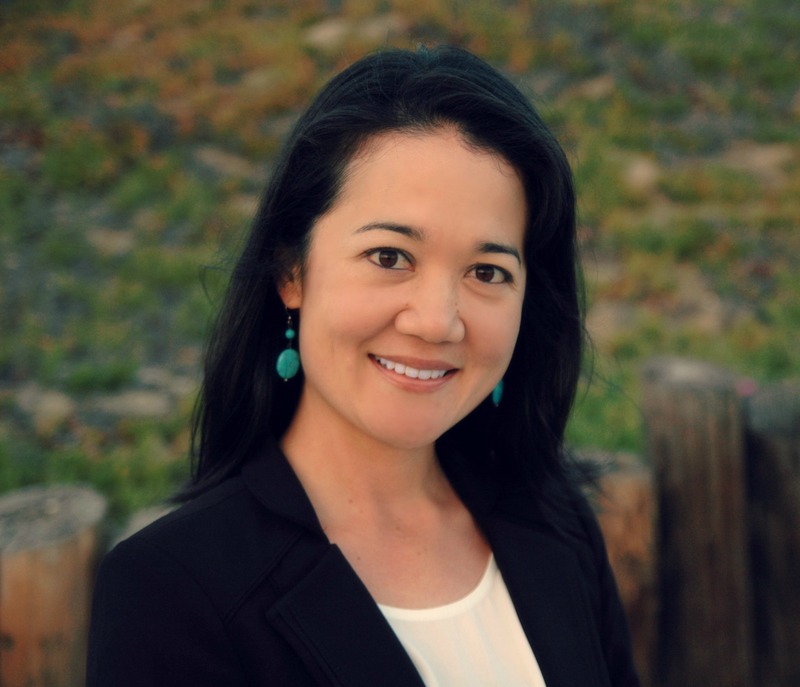 Ami Kunimura is a board-certified music therapist and founder of The Self-Care Insitute. Ami has been practicing music therapy since 2006, and runs a private practice specializing in mental health and addictions treatment, providing music therapy services to individuals, groups, and treatment centers. Ami holds a Master of Arts in Music Therapy from Saint Mary-of-the-Woods College and a Bachelor of Arts in Psychology from Loyola Marymount University. Ami has also received certifications in Yoga Education from Yoga Vidya Gurukul in Nasik, India and in first and second degree Reiki from the International Center for Reiki Training. Ami (pronounced ah-me) was born and raised in Hawaii and currently resides in the South Bay of Los Angeles.